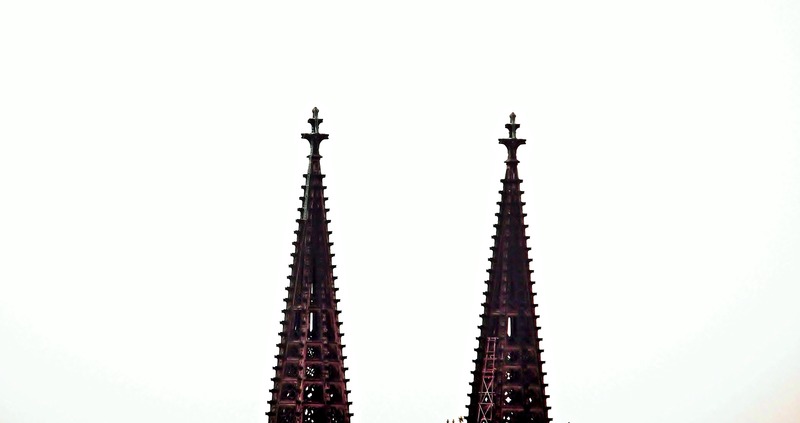 These are the spires of Cologne Cathedral in Germany, which is one of the most famous Roman Catholic churches built in Gothic style. Its hugeness and beauty are daunting. It took almost 600 years to finish this monument, yet I sometimes tenderly refer to it as my little Sagrada Familia because it never seems to be completed once and for all. I think I’ve never seen Cologne Cathedral without any scaffolds somewhere. 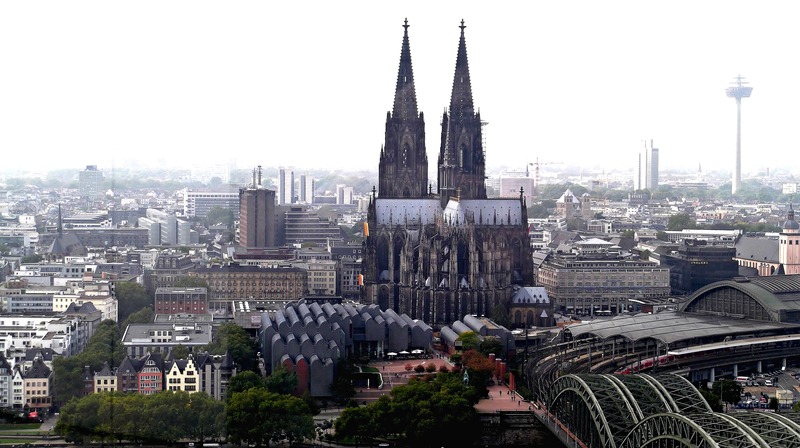 The silhouette of its western towers has become a landmark of Cologne. Here you see the whole picture. Cologne Cathedral is situated behind the Ludwig Museum on the left and the Hohenzollern Bridge on the right. The moment you realize how little the houses, cars and people are, you get an idea of its grandeur. As soon I get around to it, I will do a whole big post about Cologne Cathedral. I already have a lot of photos, and a vision how to do it, but it needs my full attention and due diligence. I recognized those spires immediately. Very nice images. Thanks for sharing! I love how when you arrive by train in Cologne, the cathedral is right there looming up from the station. We climbed to the top of the tower when we were there last year…it’s quite a climb but worth the effort. I can almost see where we stayed in your last shot. It was just a five minute walk from the Cathedral. I really enjoyed our stay in Cologne. The cathedral always looks amazing, even with scaffolding, but my favourite sights is with all the Christmas Market stalls around it! Thank for following my blog!